Starring: Josh Brolin,Sean Penn,Ryan Gosling,Giovanni Ribisi,Emma Stone, Robert Patrick,Michael Pena,Nick Nolte,Anthony Mackie. 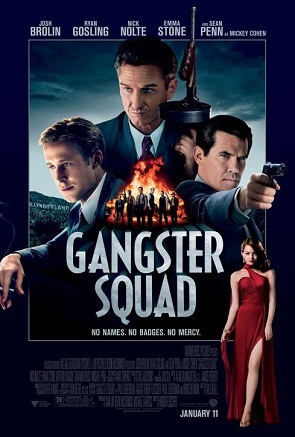 Gangster Squad set in an era of post world war 2, it gives us surreal glimpse of L.A at that time. Ruben Fleischer has directed this movie with perfection. Performance of Sean Penn is just colossal and flawless. He plays as a gangster who "Has sworn an oath of violence". The dialogues of this movie are brilliant. The film contains intense violence and nerve racking action sequences. The use of costumes and sets in this movie are hypnotizing. The soul theme of Gangster Squad is how cops turn outlaw to crush down Mickey Cohen (Sean Penn), "A boxer who used his fists to climb the social ladder of the mob". On the other hand the Squad comprises of Josh Brolin (Seargeant John O'Mara), Ryan Gosling (Seargeant Jerry Wooters), Anthony Mackie (Officer Coleman Harris), Giovanni Ribisi (Officer Conwell Keeler), Michael Pena (Officer Navidad Ramirez), Robert Patrick (Officer Max Kennard). Recruited by Josh Brolin who is a WW2 veteran and loves to bring antisocial elements to justice. To innocent residents he is a Messiah and for criminals a ruthless killer who only wants to get rid of dirt bags. Under Nick Nolte's commission Josh created Gangster Squad (not to kill ,but to break Mickey Cohen's pride so that he can't even think of acquiring Los Angeles ever again). The phases through which Gangster Squad execute Mickey Cohen and his gang comprises par excellence, pride n glory, sacrifice and courage. Josh Brolin plays a cop who always stays at the knife's edge. A war veteran who only lust for the blood of bad guys. A true hero and a great human being who always thinks about his fellowmen and wants to give his best in the line of duty. Ryan Gosling plays a cop who loose his ways in the start but afterwards he also joins the squad for the betterment of his countrymen. Giovanni Ribisi plays as a think tank. Anthony Mackie plays a cop who is excellent with guns and knifes. Robert Patrick plays as a Gunslinger. Michael Pena plays an officer who is way too much influenced by officer Max Kennard (Robert Patrick) and wants to follow his footsteps. As per violence and gore this movie is like a feast for action movie lovers. From the opening scene till the credits roll ,viewers will witness severed body parts, deafning explosions, red hot muzzles of machine guns, fists of fury n bodies filled with agony. Performance by each and every actor in this movie is brilliant. Both sound editing and cinematography of this movie mesmerizes its viewers. It's a must watch as it has countless reasons to do so.